Upgraded with Thunderbolt 3 and an Intel 7th-Gen Kaby Lake processor, the TVS-1282T3 80TB 12-Bay NAS Array from QNAP comes with 80TB of storage that is split over eight 10TB hard drives. This Thunderbolt 3/NAS/iSCSI SAN triple solution can handle collaboration between up to four Mac and Windows devices. As its increased bandwidth allows for smooth 4K video transfers and online editing, the TVS-1282T3 is well-suited for Thunderbolt 3 systems that are engaging in 4K workflows, file storage, and high-speed sharing. It has also been designed with tiered storage, application-based partitioning, and network traffic distribution. The TVS-1282T3 is powered by a 3.6 GHz Intel Core i7-7700 Quad-Core Quad-Core processor and 32GB of 2133 MHz DDR4 RAM, which can be upgraded to 64GB, using one 16GB module in each of the four DIMM slots. Network connectivity is achieved using the four Gigabit Ethernet ports and two 10 Gigabit Ethernet ports, the latter of which helps to further enhance on-the-fly video editing and rapid file sharing. This NAS also supports JBOD and a variety of RAID modes, including RAID 0, 1, 5, 6, 10, 50, 60, and hot spare, each of which offer data redundancy, speed, or a combination of both. While this configuration of the TVS-1282T3 comes with 80TB of storage split over eight 10TB hard drives, there are a total of 12 drive bays. The TVS-1282T3 has the ability to natively house both 3.5" and 2.5" SATA III and SATA II hard drives or SSD drives. There are eight drive bays that can accept both 3.5" and 2.5" drives, and there are also four dedicated 2.5" drive bays. The TVS-1282T3 can reach a throughput of up to 1600 MB/s, and using the external four 40 Gb/s Thunderbolt 3 ports, five 5 Gb/s USB 3.0 Type-A ports, and three HDMI ports, this QNAP NAS can be connected to other QNAP devices, as well as other external drives and displays. Internally, there are two M.2 slots for tiered storage and cache acceleration using separately sold M.2 2242, 2260, 2280, and 22110 flash modules. Additionally, the TVS-1282T3 is validated with FIPS 140-2 AES 256-bit encryption, helping to prevent sensitive business data from unauthorized access and breaches. Using QNAP's tiered storage functionality, storage efficiency is optimized across M.2 SSDs, SATA SSDs, and SATA HDDs. Frequently-used "hot" data is stored on high-performance SSD tiers, while less-accessed "cold" data is kept on higher-capacity hard drives. Using Application-based Partitioning, the M.2 and SATA storage devices can be configured as independent partitions for different applications, helping to ensure a sufficient throughput level for all applications. The QNAP TVS-1282T3 12-Bay NAS Enclosure operates on 100-240 VAC, 3-1.5A, and 50-60 Hz. It outputs 250W and includes four Gigabit Ethernet cables, two 10 Gigabit Ethernet cables, a power cord, two screws and two bolts for M.2 installation, twenty-four flat head screws for 2.5" drives, two M.2 SSD heatsinks, and an IR remote control. Protection is provided by a limited 2-year warranty. Featuring a high-performance 7th Generation 3.4 GHz Intel Core i5-7500 Quad-Core processor and 16GB of 2133 MHz DDR4 RAM, the TVS-1282T3 drives system performance for CPU-demanding applications. The TVS-1282T3 Thunderbolt 3 NAS not only features Thunderbolt 3 technology for faster data transfers, but also has dual 10GbE ports, giving you increased flexibility for network connectivity. The Thunderbolt 3 ports on the TVS-1282T3 are also compatible with 10 Gb/s USB 3.1 Type-C cables and devices. 10 Gb/s USB 3.1 is also known as USB 3.1 Gen 2 and allows compatibility with a greater number of USB devices for transferring large media files. The TVS-1282T3 is a good match for the Thunderbolt 3-capable MacBook Pro, and is backward compatible with the Mac Pro and iMac featuring Thunderbolt 2 via a Thunderbolt 3 (USB Type-C) to Thunderbolt 2 converter. The higher bandwidth is especially suited for creative professionals and enthusiasts from photographers and filmmakers to graphic designers who focus more on 4K or 3D workflows. Final Cut Pro X 10.3 adds support for the SMB protocol, allowing you to easily store files in the TVS-1282T3 and share files with Windows and other devices using a Thunderbolt, 10GbE, or 1GbE connection. Up to four Thunderbolt devices can connect to the TVS-1282T3 to process real-time video editing simultaneously without impacting NAS performance, while 4K videos can be directly displayed using the TVS-1282T3's HDMI output. Coupled with its large capacity potential, the TVS-1282T3 provides a solid storage solution with performance for high-resolution file storage and I/O-intensive tasks to increase productivity in multi-workstation environments. The TVS-1282T3 provides four SSD slots dedicated for caching to increase IOPS performance, and provides higher transfer speeds and reliability with the compact, energy-efficient M.2 SSD. Using an SSD cache boosts overall system performance, and is good for improving the overall workflow of random IOPS demanding applications such as virtualization. The TVS-1282T3 combines M.2 SSDs, 2.5" SSDs, and HDDs in one box to effectively realize tiered storage for improved application performance and lower TCO of storage at the same time. QNAP's Qtier Technology empowers the TVS-1282T3 with Auto Tiering that helps continuously optimize storage efficiency across M.2 SSD, SSD, and SATA drives. With Auto Tiering, the TVS-1282T3 can automatically move frequently-used "hot" data to high-performance storage tiers and less-accessed "cold" data to lower-cost, higher-capacity drives, making the TVS-1282T3 an efficient shared resource. Qtier now supports "On Demand Allocation Priority," providing customizable flexibility to arrange tiered storage suited for your system environments and application demands. Application-based Partitioning is aware that every application has varying levels of performance requirements. For example, Surveillance Station requires higher-priority access to storage to ensure the integrity of recordings, while normal transmission speeds are sufficient for file sharing. However, when multiple applications are running on the same storage media, the required throughput level cannot be guaranteed, as the storage media is busy handling I/O requests from all of them. The TVS-1282T3 supports three different types of storage media: M.2, SSD, and SATA hard drives, and they can be configured as independent partitions for different applications, ensuring a sufficient throughput level for every application. Network Traffic Distribution utilizes four GbE and two 10Gbe ports, allowing applications to use dedicated interfaces to meet network traffic distribution requirements. Network interfaces can also be easily managed with the Network & Virtual Switch app, which enables optimized network resources for TVS-1282T3, virtual machines, and containerized apps. No matter if they are business organizations or individual users, they can manage network connections by using the Network & Virtual Switch. The TVS-1282T3 comes with three HDMI ports (4K / 30 Hz output) for using three monitors in either "duplicated" or "extended" desktop configuration. You can connect the TVS-1282T3 to an HDTV or A/V receiver and use the media player in HybridDesk Station (HD Station) to enjoy rich media content and 4K videos. HD Station supports multi-tasking and user authentication so only authorized users can access the stored data. Besides using the bundled remote control, you can also turn your mobile devices into remote controls by installing the Qremote app to control HD Station. You can customize the actions of individual buttons of your QNAP remote control using QButton. From playing music to viewing surveillance feeds in Surveillance Station and shutting down or restarting the NAS, everyday and common tasks can be just a button press away with QButton. As Apple computers do not natively support 10 Gigabit Ethernet, Mac users previously needed to purchase a Thunderbolt-to-Ethernet adapter to connect to high-speed Ethernet networks. The Thunderbolt-to-Ethernet (T2E) allows computers without Ethernet ports (such as the MacBook Pro) to access 10GbE network resources over a Thunderbolt connection to the TVS-1282T3. This saves users from having to buy adapters or converters and streamlines the connectivity process. The TVS-1282T3 can simultaneously run general Ethernet services in addition to the Thunderbolt 3 network, completely independently and with no bandwidth interference. As a NAS that combines Thunderbolt, NAS, and iSCSI SAN into one box, the TVS-1282T3 prevents the restriction of DAS connecting to only one device, and breaks the cost barrier for creating 10GbE high-speed network environments. You can directly access files on the TVS-1282T3 on a file-based level. Simply attach your computer to the TVS-1282T3 with a Thunderbolt 3 cable, and you will find the TVS-1282T3 in Finder/File Explorer with accessible shared folders available for you. The TVS-1282T3 also features Ethernet networking for flexible file sharing across multiple devices simultaneously using SMB/CIFS, AFP, and NFS for sharing across Windows, Mac, and Linux/UNIX networks. Use Qfinder Pro to find the TVS-1282T3 attached to your computer, and you can find the Thunderbolt IP and Ethernet IP for file sharing based on your needs. The TVS-1282T3 supports iSCSI SAN configuration, while the Thunderbolt interface can contribute a lot to iSCSI SAN storage performance. After creating an iSCSI target on the TVS-1282T3, you can access the iSCSI with your computer through the Thunderbolt IP. High Accessibility (Mac + JBOD) mode allows three Mac workstations to be attached to the TVS-1282T3 via Thunderbolt 3 ports for online video editing, while the remaining Thunderbolt 3 port is used for storage expansion by connecting up to six NAS expansion enclosures (TX-500P / TX-800P). You can also take advantage of the built-in 10GbE LAN card for multi-device file sharing over a 10GbE network at the same time. Optimal Collaboration (Mac + Mac) is designed for when multiple workstations are used together to speed up a project. Each workstation can be connected separately to the Thunderbolt 3 ports on the TVS-1282T3 for simultaneous, speedy video editing. Dividing Resources (Mac + NAS) should be used for large-sized video productions that require multiple servers to increase productivity with different workflow stages, such as capturing, editing, production, post-production, and dubbing. In this situation, it can be helpful to daisy-chain an additional six TVS-1282T3 units to the original TVS-1282T3 and arrange each NAS for dedicated workflow stages, while the other Thunderbolt 3 ports are connected to the workstations for smoothly accessing large-sized video files. Meanwhile, each TVS-1282T3 allows file sharing with multiple devices through Gigabit or 10 Gigabit Ethernet networks. Seamless Expansion (JBOD + JBOD) helps assure users that massive files are safely stored on the TVS-1282T3, which supports seamless capacity expansion to offer abundant storage. You can connect up to six NAS expansion enclosures (TX-500P / TX-800P) to the TVS-1282T3 through Thunderbolt 3 ports and share files via the 10GbE network. 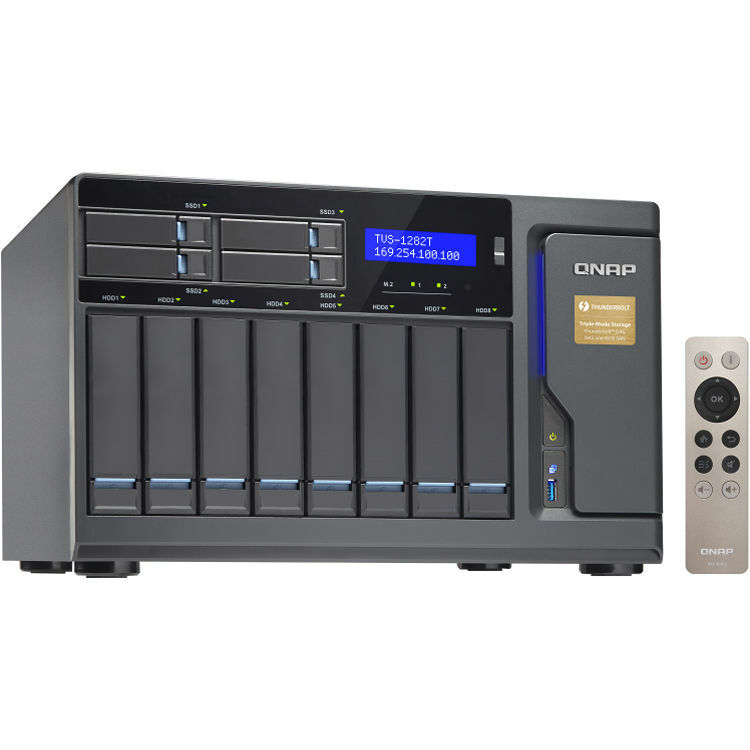 The intuitive QTS features a modern flat design to help you manage QNAP NAS easily. QTS provides an intelligent desktop, graphical dashboard, drag-n-drop icons, and grouped shortcuts to make storage and file management extremely simple. You can even open multiple application Windows to run multiple tasks concurrently, bringing greater operating efficiency. The built-in App Center contains install-on-demand apps to provide potentially limitless potential for the NAS. QRM+ is QNAP's Centralized Management Solution, designed for IT teams, for networked computing devices. It provides a single-point solution to discover, map, monitor, and manage all of the critical computing devices (including servers, PCs, and thin clients) in your network, and facilitates device discovery with the graphical topology diagram. QRM+ supports IPMI 2.0, provides remote KVM (Keyboard, Video, Mouse) for certain IPMI devices, and supports tracking every action using KVM recording and playback. Simply install QRMAgent on your Window® and Linux devices and you will see their system status on the QRM+ management interface. With centralized management using QRM+ on the TVS-1282T3, IT infrastructure and device security is enhanced while troubleshooting and network resource performance analysis is greatly simplified. Virtualization Station allows you to host virtual machines (VM) on the TVS-1282T3 and access them via a web browser or VNC. It supports multiple operating systems, fast VM creation, VM backup & restoration, VM import/export, snapshot, and Device Management for centrally managing VMs. The TVS-1282T3 also features Container Station, integrates LXC and Docker lightweight virtualization technologies, allowing you to operate multiple isolated Linux systems on the NAS, as well as download apps from the built-in Docker Hub Registry. Containers Station also supports the QIoT Containers platform that helps quickly structure your IoT environment and deployment on your private IoT cloud. The TVS-1282T3 is a comprehensive iSCSI/IP-SAN storage solution, and supports VMware, Citrix, Microsoft Hyper-V, and Windows Server 2012 R2, benefiting flexible deployment and management in virtualization environments. The TVS-1282T3 supports VMware VAAI and Microsoft ODX to increase performance by offloading server loading for ESXi server and Hyper-V respectively, and supports QNAP vSphere Client plug-in and QNAP SMI-S provider with enhanced operational efficiency and management in virtualization applications. The TVS-1282T3 provides Qfiling and Qsirch for organizing and searching for files, providing you with an efficient data storage center. Qfiling automates file organization - simply determine filing conditions, set a schedule, and files will be organized and archived based on your settings. The Qsirch full-text search tool features quick file searching and supports thumbnail previews, content abstract, keyword hints, and more, saving your time spent looking for files on the NAS. It can be hard to manage emails and contact information that are scattered across multiple computers, devices, and accounts - not to mention if important emails or contact information are lost or become inaccessible due to account closure or device malfunction/loss. QmailAgent and Qcontactz help you centrally store and manage emails and contact information, making them accessible to all of your devices at any time - and with the powerful Qsirch search engine, you can find specific contacts and emails. QNAP's full NAS encryption by volume-based technology helps ensure data security by encrypting all of the files stored in the default shared folders on the TVS-1282T3. Besides AES 256-bit encryption for both volumes and shared folders, the TVS-1282T3 also provides numerous security options, such as antivirus, encrypted access, IP blocking, 2-step verification, and more. The TVS-1282T3 offers flexible backup solutions for Windows and Mac users, Volume/LUN snapshots (up to 256 snapshots per volume or LUN, and maximum 1024 snapshots per NAS), Folder snapshot, Snapshot Replica and Clone, and disaster recovery solutions, including RTRR, rsync, and cloud storage backup (Amazon Glacier, Azure Storage, Google Cloud Storage, Google Drive, Microsoft OneDrive for Business, Dropbox, and more) are also included. The TVS-1282T3 supports capacity expansion by connecting up to six Thunderbolt storage expansion enclosures using the TX-800P or TX-500P. You can gradually expand the TVS-1282T3's storage on demand, and use the QTS Storage Manager to easily handle the NAS capacity expansion and storage expansion enclosure management. Besides using physical storage expansion enclosures, there is an additional option to expand NAS storage capacity. QNAP VJBOD (Virtual JBOD) is network-based JBOD, allowing you to expand the storage capacity of a QNAP NAS with unused storage space from another QNAP NAS. You can mount iSCSI LUNs from a QNAP NAS to the TVS-1282T3 as local disks and create virtual storage pools and volumes for operating NAS services. VJBOD supports 10GbE/40GbE Ethernet connection interfaces and port trunking (link aggregation with multiple LAN ports) that increase the performance and reliability of your VJBOD storage. Box Dimensions (LxWxH) 19.13 x 17.13 x 15.0"
What are the specs on the drives included in this array?